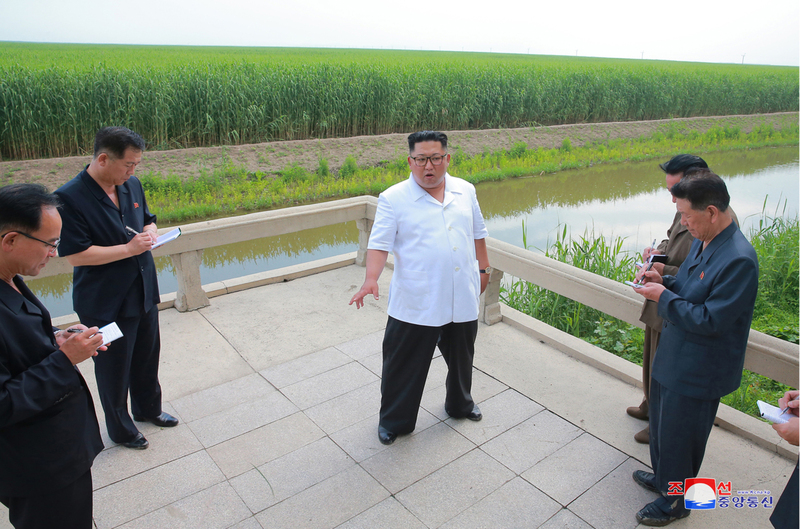 Kim Jong Un issues instructions during a visit to Sindo County, North P’yo’ngan Province (Photo: Rodong Sinmun). 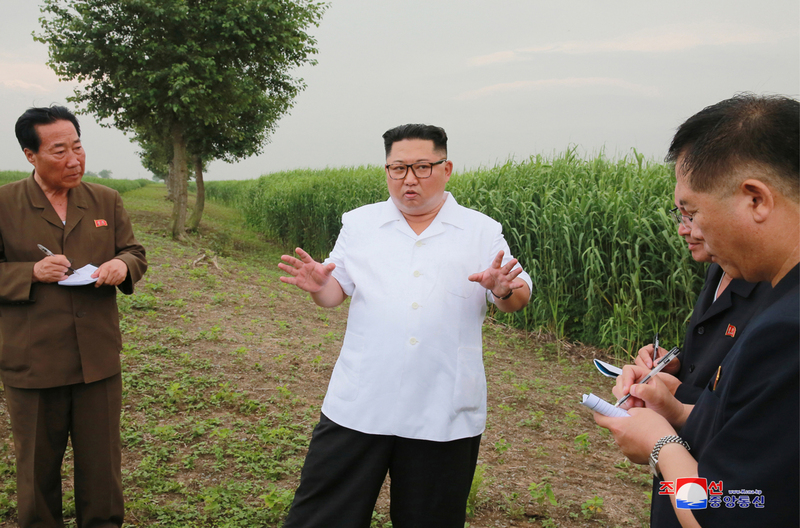 DPRK state media reported on June 30 (Saturday) that Kim Jong Un (Kim Cho’ng-u’n) visited Sindo County, North P’yo’ngan Province and conducted a field inspection of Korean People’s Army (KPA) Unit #1524. 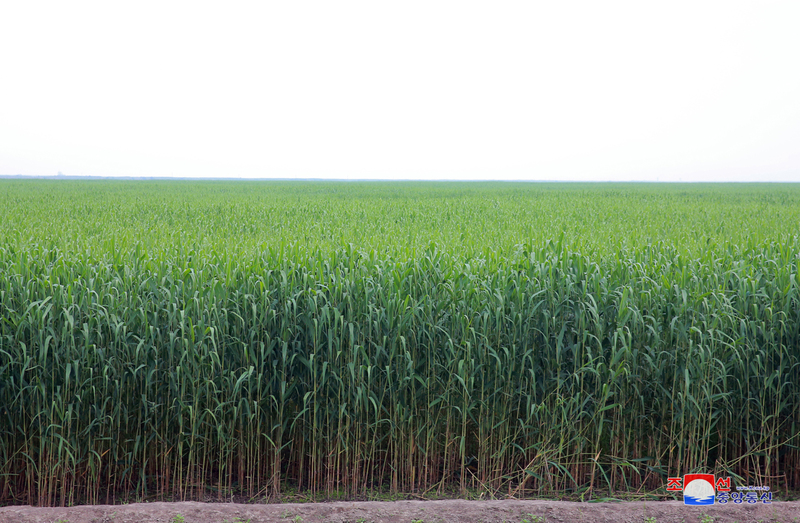 His first visit was to Field #14 of Reed Branch Farm #1 which is under the Sindo County Combined Reed Farm (several reed farms consolidated into one production unit). Also in attendance were Personal Secretariat (Office Director of the Chairman of the State Affairs Commission of the DPRK) Chief Kim Chang Son (Kim Ch’ang-son), Workers’ Party of Korea (WPK) Organization Guidance Department Senior Deputy Director Hwang Pyong So (Hwang Pyo’ng-so’), WPK Economic Affairs Department Director Han Kwang Sang (Han Kwang-sang), WPK International Affairs Department Deputy Director Kim Song Nam (Kim So’ng-nam) and Personal Secretariat Deputy Chief and WPK Organization Guidance Department Deputy Director Jo Yong Won (Cho Yo’ng-wo’n). The farm had previously been visited by late DPRK President and founder Kim Il Sung (Kim Il-so’ng) and late DPRK leader Kim Jong Il (Kim Cho’ng-il). 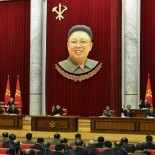 Kim Jong Talks with senior WPK officials during his visit to Sindo Country. On the right is Hwang Pyong So (Photo: KCNA). He remarked that he “would send high-powered tractors and other vehicles to the country” and then “assigned the relevant sector to tasks to preferentially provide the country with fuel oil, tires and vehicle accessories.” He said that he would “learn about the conditions of generating and pumping equipment and tugs and lighters,” then “take steps to maintain them and work out to provide new ones and help it in a responsible manner.” Kim Jong Un then tours the Reed Branch Farm #1’s mechanized work team. 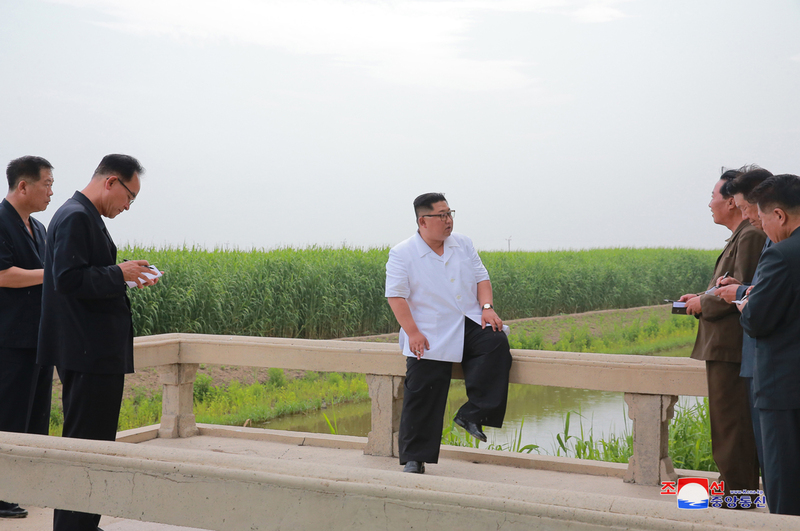 Kim Jong Un leans against a bridge whilst inspecting a reed farm in North P’yo’ngan (Photo: KCNA). 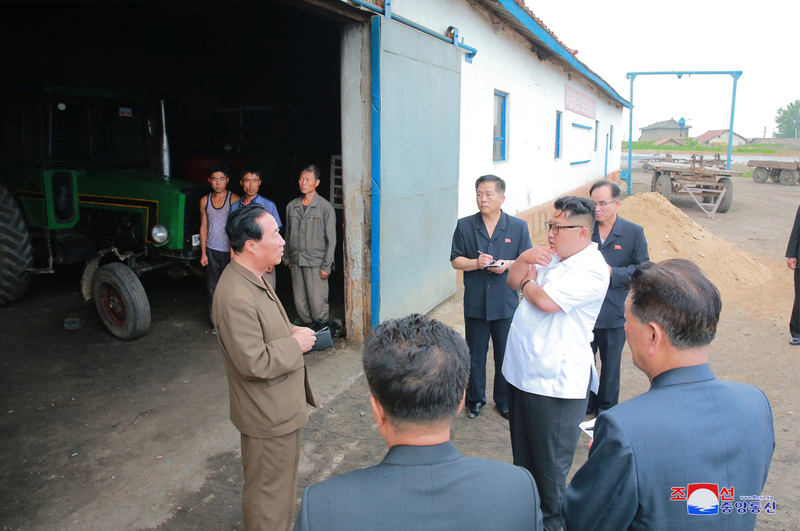 Kim Jong Un is briefed about the use and maintenance of farm equipment (Photo: Rodong Sinmun). 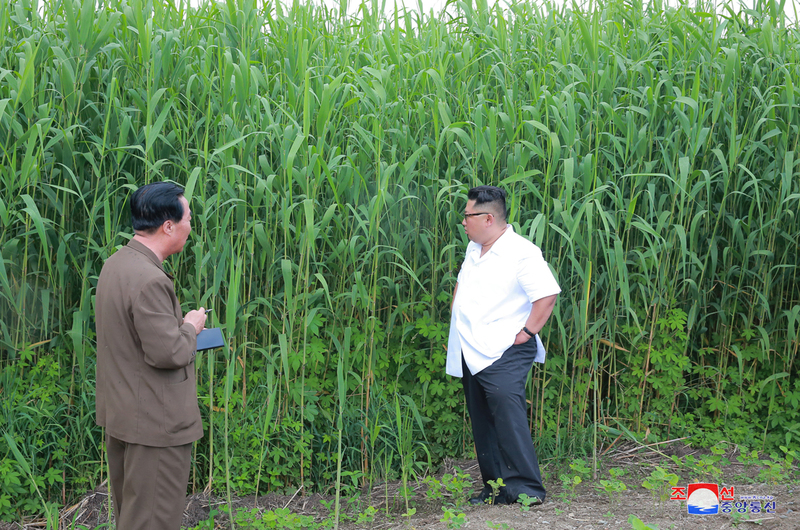 Kim Jong Un in Sindo County (Photo: Rodong Sinmun). 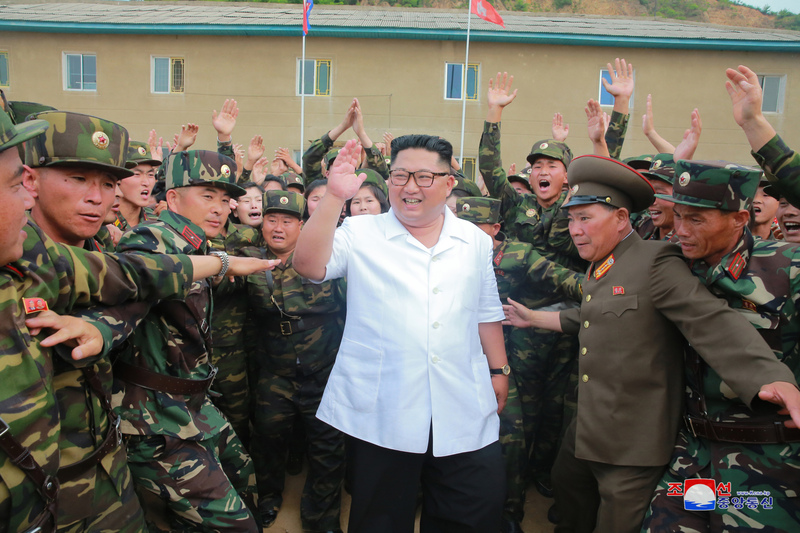 Kim Jong Un responds to the cheers of officers and service members of KPA Unit #1524 (Photo: Rodong Sinmun). 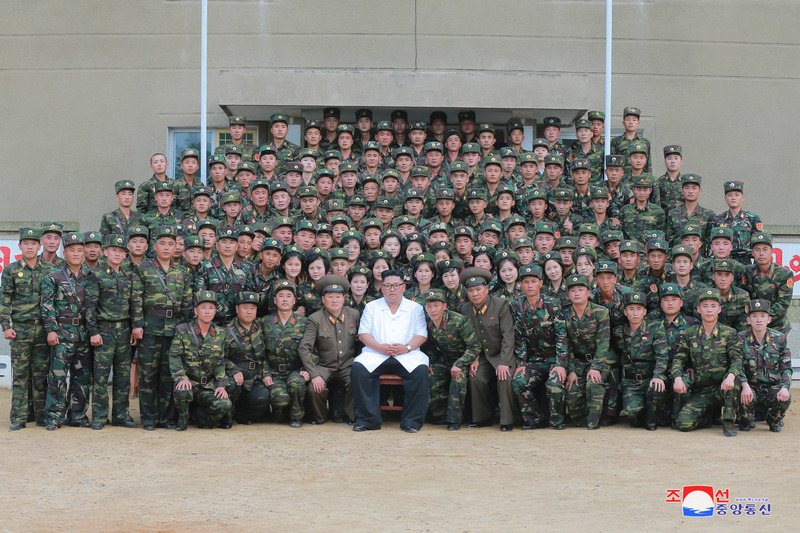 Kim Jong Un poses for a commemorative photo with commanders, officers and service members of KPA Unit #1524 (Photo: Rodong Sinmun). Prior to a commemorative photo sessions with service members and officers of the unit, he “expressed the expectation and belief that the servicepersons of the unit would creditably discharge their mission and role as frontline soldiers defending the gate to the socialist country with the red arms of revolution in their hands. 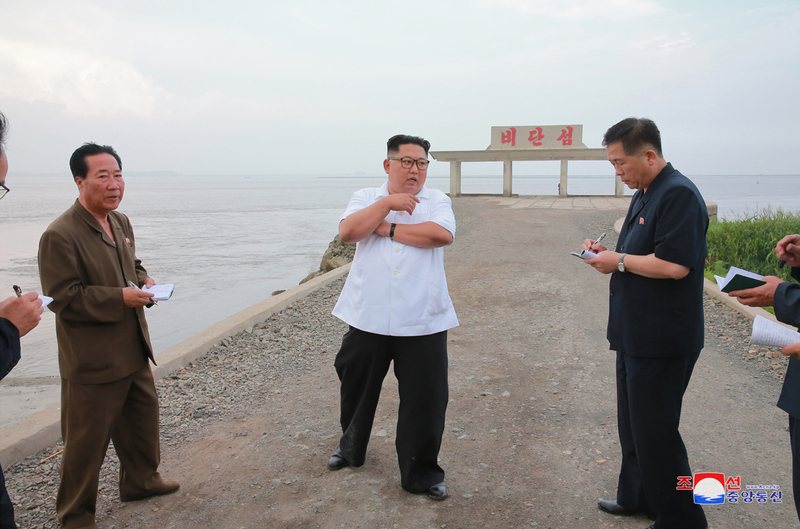 This article was written on 30 Jun 2018, and is filled under Central Committee, Central Military Committee, chemical facilities, Comprehensive Affairs, corps command, county/city party organizations, critical infrastructure, DPRK Cabinet, DPRK Energy Policy, DPRK Premier, DPRK-China Joint Guidance Committee, DPRK-China Relations, DPRK-PRC Border, Economic Complexes, Events Management Section, Executive Policy Bureau, Finance and Accounting, Financial Planning Department, Five Year Economic Plan and Development Strategy (2016), food production, General Affairs, gsd, Guard Command, Guidance Tours, Han Kwang Sang, Hwang Pyong So, Hwanggumphyong (Hwanggu'mp'yo'ng) Economic Zone, internal security, International Affairs Department WPK, International Department, Jo Yong Won, Kim Chang Son, Kim Chong-un inspections, Kim Family, Kim Jong Un Visits, Kim Jong-il, Kim Jong-un, Kim Song Nam (IAD), KJI Personal Secretariat, Korean People's Army Supreme Command, Korean People's Internal Security Forces, Korean People's Army (KPA), Korean Workers' Party (KWP), KPA basic party organizations, KPA construction battalions, KPA construction brigades, KPA General Logistics Department, KPA General Political Bureau, KPA General Political Department, KPA General Propaganda Department, KPA General Staff, KPA infantry corps, KPA Organization Department, KPA Party Life, KPA Supreme Command, kpif, land and enviroment, local people's committees, Main Office of Adjutants (Central Party Office #6), Military Affairs, military economy, military security command [msc], Ministry of Agriculture, Ministry of Chemical Industry, Ministry of Food and Procurement, Ministry of Foodstuffs and Daily Necessities, Ministry of Land and Environmental Protection, Ministry of Land and Marine Transport, ministry of people's security, Ministry of State Security, Ministry of the People's Armed Forces (MPAF), MPAF GPB, North Korean press, North Pyongan KWP Provincial Committee, North Pyongan Provincial People's Committee, Notification, On the Spot Guidance, Organization and Guidance Department, party life, Political Bureau, Provincial Party Committees, Provinicial People's Committee, Public Information Commission, rural management committees, Secretariat, State Academy of Sciences, State Affairs Commission, State Security Department, VIII Army Corps, water facilities, WPK Economic Affairs Dept.